While it seems that technology changes at the speed of light, we know that ministry changes at the speed of life! Wouldn’t it be great to have one tool that equips you and your team to manage, grow, connect, and protect your entire church? Now you can! 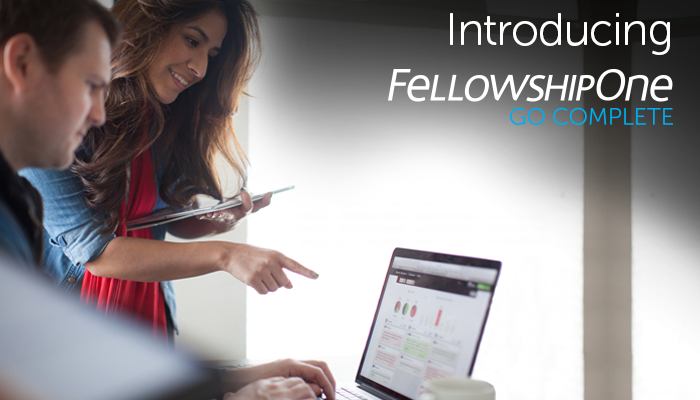 Introducing FellowshipOne GO Complete, the newest solution in Church Management that bundles all the tools you want and need in one place. With FellowshipOne GO Complete, we’ve bundled together all the tools you need to grow your ministry. It’s the easy-to-use, easy-to-start solution that combines the power of member management with the ease of Online Giving, the efficiency of Check-In, the reliability of Church Accounting, the simplicity of Websites, the convenience of Mass Messaging, and peace of mind of integrated Background Checks. Introductory Pricing for as low as $169 per month. Check the pricing calculator. Try a free 30-Day Trial of FellowshipOne GO church management system today!